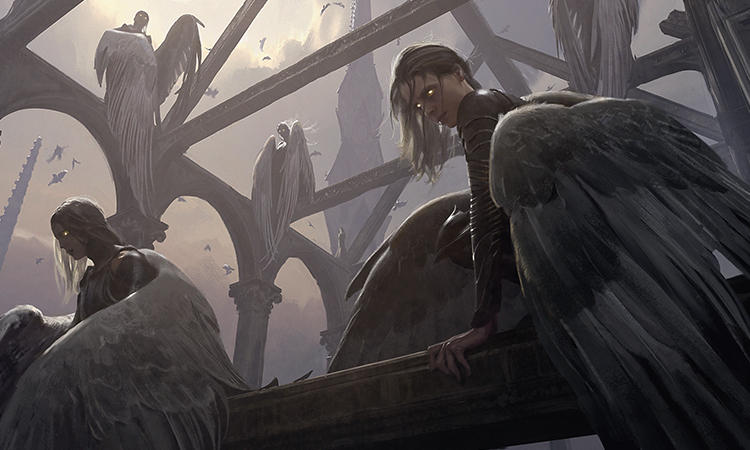 Jace and Tamiyo have followed clues to Thraben Cathedral, the roost of the mad angel Avacyn. Avacyn attacked, and now the three of them are locked in battle. 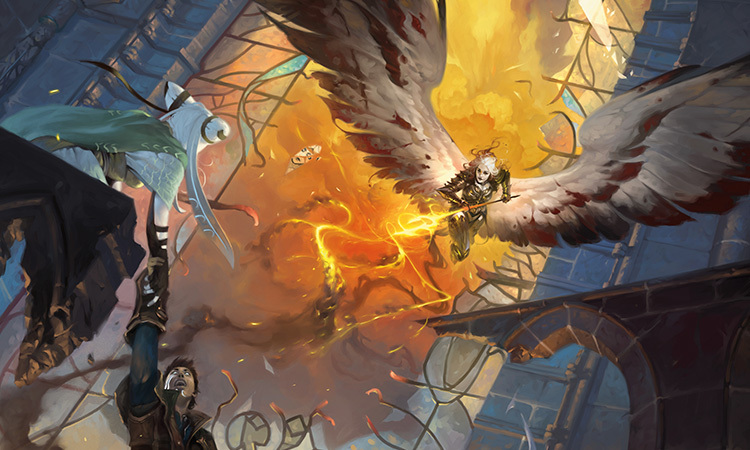 Jace has been unable to contain Avacyn's divine power, and Tamiyo, for her part, is unwilling to break personal promises in order to help save his life. 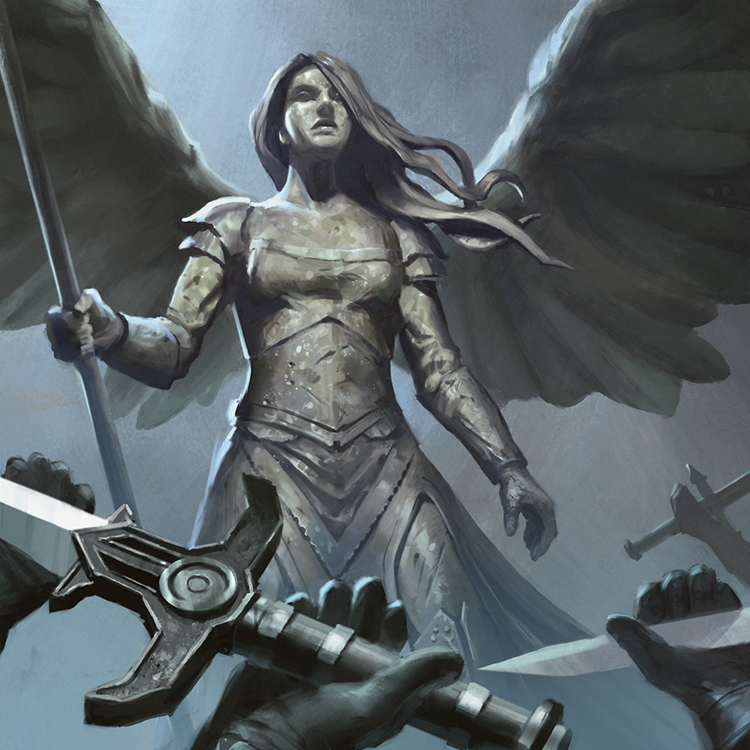 Avacyn bears down on the pair and will soon destroy them both. The two fiends cower before me like a stain on the cathedral floor. They avert their eyes, unworthy of my sight. I know they are not of this world, but I know they bleed. I can feel their heartbeats under their throats, at the tip of my spear. One more gentle thrust and I will unmask these demonic creatures, send them into the oblivion they deserve, and cleanse the world of them. I am Avacyn. I am to protect. One of them, the creature in the blue cloak, pleads with me. As he speaks, I see worms spilling from his mouth. "Avacyn, this isn't you," he coughs, his claw holding his head. "You don't have to do this." The words crawl away into the shadows like centipedes. Even more than my spear, my sight is my greatest weapon. My eyes see more than the humans can, more even than my fellow angels. I see the angelic heralds in the stained-glass windows, how they bow to me in deference. I see the moonlight that follows me in my travels, even here inside the cathedral, and the white-feathered doves that scatter forth from wherever my feet touch earth. Most of all, I see the squirming jelly behind the faces. I see the revolting lies that hide dressed in human form. I alone exist to open them to the light of justice. "You're ill, or misinformed," says the other fiend, her long ears pulled back behind her head. Her eyes are empty sockets, and behind them all I see is coarse black hair, writhing. "You're meant to protect people, not—this." I push toward her with my hand, and my light blasts the demon back. She slams against the wall, coughing, and the sounds that fall out of her become bedraggled black hair. "I am the bulwark against fiends from without," I say, aiming my spear at her. The spear's points bend into a scolding finger. "I destroy wickedness, no matter its origin, no matter its form. I have seen you crawl across my provinces, slither into my church. But now I see you. And now you answer to me." I call to the light, and it obeys. A cold flickering manifests in my hand, and the shadows of my fingers fall across the trembling demons. 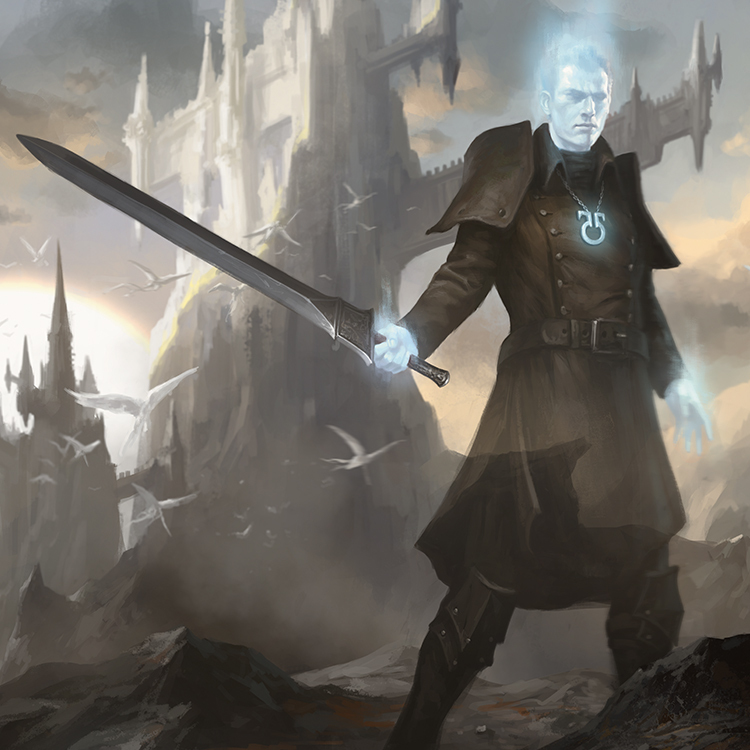 "Finally," I say, "your corruption of Innistrad ends." Something stirs up on the roof. I look up to see the skylight explode, a man crashing through it feet first. Tinted shards rain down into the cathedral. The glass bounces off my skin as the demons shield their heads. The man crashes onto his feet, sword in hand. He stands straight, his boots grinding glass. He is unhurt, his white hair barely ruffled. It is one of the bloodsuckers, and an ancient one. I recognize him, but I cannot quite bring his name to mind. "Stand aside, vampire," I say. "I will deal with you next." But his body blocks my way. His weapons are already drawn: a longsword readied in one hand, a spell in the other. "There's something wrong with you, Avacyn," the vampire says. His mouth is a leech's mouth, the words bent around a bloody circle of fangs. "I've come to help." "Do not attempt to stay my spear, bloodsucker, or you will feel it yourself." I cannot quite recall his title, but I see him. His face ripples with leeches, slithering just beneath the skin. He reeks of blood. "Avacyn," he says. "I need you to come with me down to the cellar. You'll see what I must do, if you'll just wait for a moment—"
"My mission never waits," I answer. I hurl the holy magic at him, and it hits him full in the chest. "Avacyn," he says. "The cellar. We have business we must attend to." "Sorin," says one of the creatures, her empty eyes directed to the vampire. "You can help her, can't you?" "Silence," he snaps, and the demons jolt with the force of his voice. He turns to me again. "Listen to me. If you have some grievance with these two, you may kill them before we begin." The two fiends look at each other. "But I won't permit you to leave this place until our business is concluded." In the rafters high above, feathered wings rustle. The eyes of a dozen of my blessed angels look down on us, flashing and beautiful like the stars at midnight. I find myself wondering something. An angel is made of goodness—but is goodness made of an angel's acts? I do not know why this question occurs to me now. "I warn you, vampire," I say. 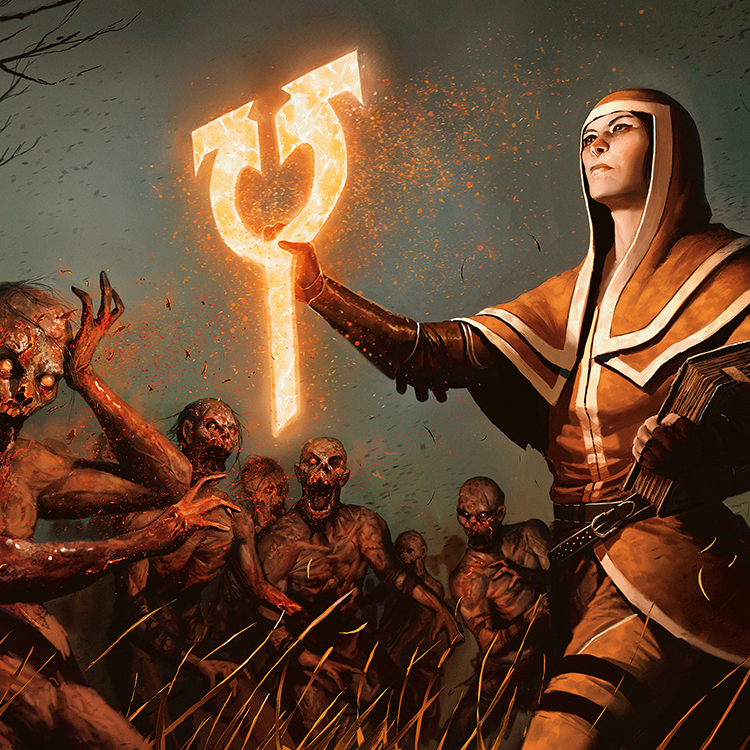 "These invaders are the foulest threat on Innistrad, but you are in danger of becoming the greater evil in my sight. Begone, or I and my host will strike you down." He steps toward me in disobedience. I pummel him with hallowed light, but again the spell does not harm him. He tilts his head. His eyes look almost concerned, but his leech's fangs flex, mocking me. I hear laughter. A sliver of doubt inserts itself into my mind—not that I may be defeated, but that I may have hesitated at the moment I released the spell. I may have prevented myself from striking him down. I do not know why this should be. I hear the wings of the angels who perch in the rafters above me, and I can feel their starlight eyes on me. I steel myself in their light. As I raise my spear-tip to the vampire, it curves into a blade of justice. The vampire takes another step, so that his chest rests against the spearhead. 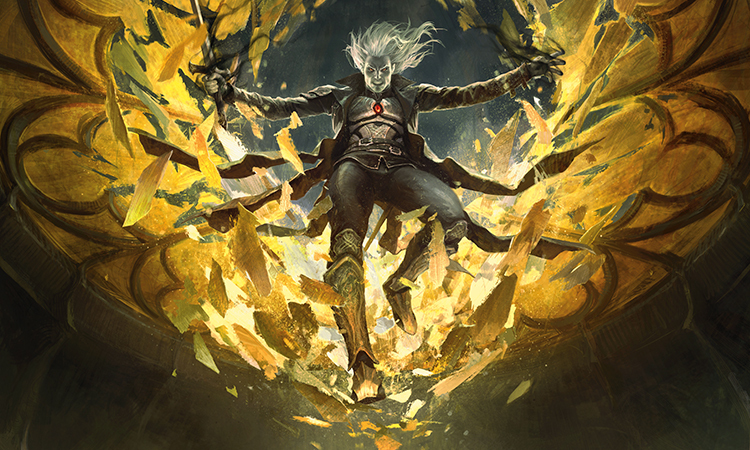 "Avacyn," he says with his bloody mouth. "You cannot harm me." He reaches out to me. "And there is a reason." The next words he says leave a mark on me. They are just sounds, just vibrations in air. But I feel them like a carver's knife. Like an inquisitor's brand. "I am your creator," he says. The words feel old, as if they have been chiseled somewhere inside me, dust gathering in the troughs. But now the dust floats away, and I see him. He is Sorin, of the Markov bloodline. I see him. His mouth is not round like a leech's—I do not know why I perceived him that way before. His white-within-black eyes and high cheekbones are not unlike my own. He is my creator. The truth of it is plain to me now. As I see him, I see myself. He is the reason I exist. He was there when I was created, the man who stood over me that first instant when I came into being. It was he who imbued me with my mission. My creation happened here, in the deep reaches of this very cathedral. 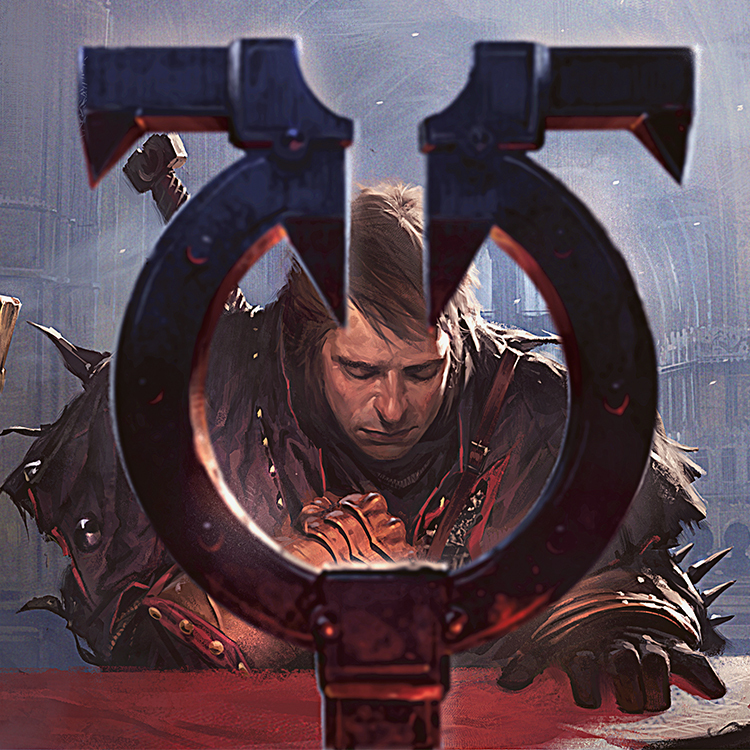 I know now that he made me, Innistrad's divinity, for one purpose. To root out threats to Innistrad. To answer the prayers of the innocent, and to strike down those who would torment them. To protect those who would otherwise be devoured by the shadows of this world. "You are my creator," I say. "Then you must be good," I say. My creator's smile is gentle, showing just the slightest edge of fang. "You are the source," I say. "Of me. And therefore. Of goodness." "That's right, Avacyn. And so that you can be the best you can be, you must join me. Come." He reaches his hand out to me, but something makes me hesitate to take it. I look at the two people I have battled tonight, their backs against a wall of the nave. They still look as fiends to me now, but also like a woman and a man. Mages. Mortals. Their blood has been spilled in my cathedral. I can smell the tang of copper on my blade. But this could only be so if they were wicked. If I have struck them down, then what could they be but monsters? An angel is made of goodness—is goodness made of an angel's acts? My creator regards me. His eyes are cold as they scrutinize my face. I can see his pulse in the pale skin of his neck, the vein beating with someone else's warm blood. A mother, crying over her child. I have set those fires. I have slain those innocents. I was created as a defender, as a protector—and yet that protector has brought destruction. And I was not only a protector, but a symbol. An entire church grew up around me—but the church has kindled a zealous hatred, and my power has fanned those flames. What does it mean to be good? Is goodness made of an angel's acts? I look at my creator and tilt my head at him. I was made, but I was made imperfectly. With flawed sight. I am not a protector at all, but a danger, a weapon for those who would wield me to harm this world. I square my shoulders toward my creator and flex my pinions. Moonlight gathers on my body. My skin glows, and I can see doves flying in the cathedral around me. It is clear to me now what I must do. "Avacyn," Markov says, his voice low, a predator's tone. "Scion of Markov," I announce, raising my spear. Its blades curve and warp to jab at his chest. "You have allowed this to happen." "You should be careful what you say to me, child," Markov says. "I am not your child," I say. "I am your creation. You are responsible for everything I am capable of. I was made for a purpose, and your purpose was impure. Sorin Markov, I condemn you as the greatest evil of this world." "You've fallen out of line," Markov says through his teeth. "Wait, Sorin—" warns one of the fiends. "Don't. The consequences for the plane—"
"Why would you allow this?" I ask. "Why would you make me this way?" I press with the spear against his chest, scratching the armor. Markov sneers. The blade in his hand flashes in the light from the rafters. "Avacyn, come down to the cellar," he says. "Let us discuss your creation." "You created me to ensure that all wickedness meets its demise," I say. "Prepare to meet yours." I lunge with the spear, using every bit of my divine strength. Somehow, the blade misses his chest, and I fall past him. He lashes me with draining magic, but I turn in time to deflect it away. I claw at him, channeling light into the blow. It connects, but only rakes sparks across his armor. He swings back at me, batting me with the flat of his blade. Still, it's strong enough to rattle my ribcage. I raise my spear in both hands, the deadly end pointing to the heavens. I channel my wrath into the weapon, and it thrums with divine power. "You were made to be loyal to me," Markov says. "You can't harm me." "It seems not," I say. "But they can." He looks up to see the angels I have called down on him. They dive from the rafters. He barely has time to shield his face before they crash onto him, their graceful hands tearing at him like talons. But he fights back, and his blows are terrible. He impales one angel with his sword and slices through the wing of another. He throws one angel to the floor, cracking the marble, and another through a column, turning the masonry to powder. He holds another by the neck as she attacks him with furious claws, buffeting at his face and shoulders. I will my strength to her, but I can see her essence flowing into him, dark liquid strands from her eyes and mouth into his own. She seizes into a hunch, like the rictus of a crow. He turns to me, his leather torn and his chest plate raked open. My angels have weakened him, but he is far from defeated. He taps the tip of his sword on the marble. "This changes nothing, Avacyn," he says. I call, and the last three of my twinkling-eyed angels, the final guardians of the Cathedral, encircle him. They attack him in concert with sword and claw, blows many and fierce. They close in on him, shrieking, slicing from all sides. Markov must feel the way I felt inside the Helvault, with demons' wings grazing me in the lightless void. One by one he destroys my angels. He charges into one, slamming her through row after row of stone pews. As the next swoops at him, he hurls his sword overhand, catching the blade in her chest and impaling her. She falls in a heap. He grabs the final attacker by the shoulder, looks her in the eye, and throws her through the floor-to-ceiling stained-glass window. The wall shatters into a thousand shards. The angel arcs somewhere off the bluff. Markov turns back to me once more, a snarl revealing one of his fangs. I put my spear-blade against his neck, but I can feel it resist harming him. I lean into it, and it simply fails to cut him. I focus on his face. I remind myself—he is not a vampiric noble, but a horror. He is a monster, a blood demon, a leech. And I see him anew. His eyes become mouths, ringed with teeth. His face is a flimsy mask. He is my creator, and he is the embodiment of evil. 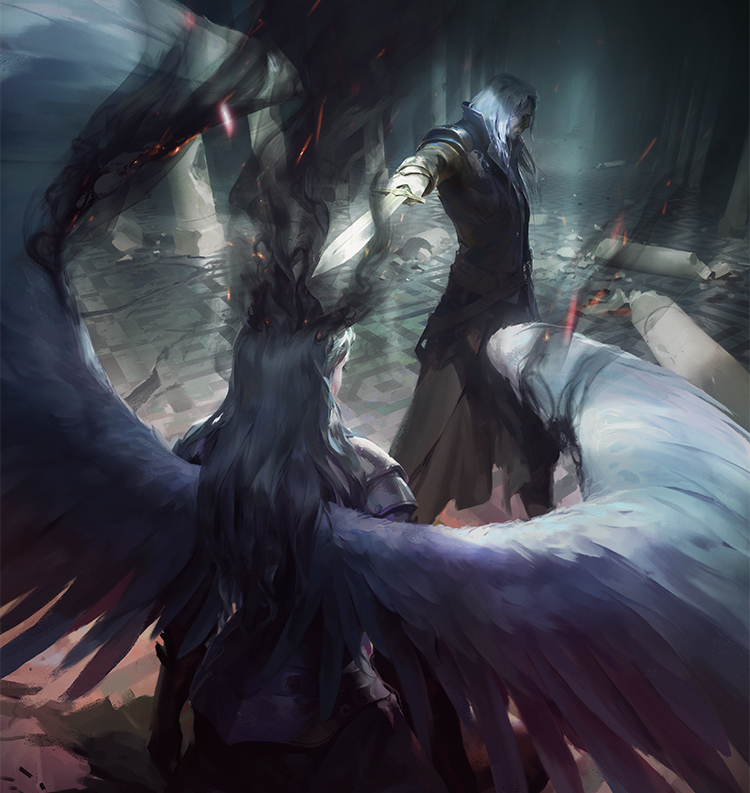 "Avacyn—" he begins through a leech's mouth, and I slash my spear through his neck, cutting deep enough to hit bone. He roars and leaps back, grasping his neck. Rotting ooze gushes from between his fingers, turning to sickly fungus on the flagstones. He leaps at me, sword aimed at my heart, and the blade sparks along my spear as I parry. I pivot to strike him, but I must duck his claw, and the blow severs tendons in my wing. When I lunge to push light through him, it is met with a blast of blood magic that scatters my spell. I shriek and dive into him, breaking a column with his body, crashing him through glass and splintered wood until he is shoved against the wall of the cathedral. The monster's head tilts and I hear bone crack against bone. His neck wound has begun to scar over. The mouths in his eye sockets drool words. "Avacyn. I must do this." "And I, this," I say, and I sink my spear through the gap in the monster's chest plate, so deep that the blade hits the granite of the cathedral wall on the other side. He roars and I am blasted back. I skid to a halt. Markov clutches the spear handle and yanks out the blade, and for a moment I can see the slimy animal that must serve as his heart. Squirming lampreys flow from the wound. He drops the spear and his own sword, and they clatter alongside one another. He clutches his wound closed with one claw. "You are lost," he mouths. "You can only see me as a monster now, and that is why you can harm me." "You are a stain on the world," I say. "It is only now that I am able to see that clearly." His attack comes at once, almost faster than the sound reaches me. We grapple, clamping our hands into each other's shoulders. We slam each other through pews. We lift each other up into the rafters, fragmenting the beams, and our struggle is clouded with plaster dust and feathers. I scrape at his jawing face, and the wounds do not heal immediately. My fingers find flesh and shred it, and acrid smoke seeps from the wounds as great chunks of Thraben Cathedral fall to the floor far below us. He grimaces and suddenly locks his claws onto my upper arms, pinning me as I thrash my wings to keep us aloft. His muscles are steel, and he's bending my arms behind my back, dislocating a shoulder. I realize he was holding back before. This is his true strength. He bites my neck, and the pain is like a thousand innocents screaming, a thousand pleas for aid, a thousand prayers I will never answer. I feel my blood pumping at my throat, drawn by suction. When we fall, it is not from gravity, not from a weakness in my wings. We fall because he drives us down, his strength slamming us from the height of the Cathedral down to its floor. When we slam to a halt, we lie in the cellar of Thraben Cathedral, a ragged hole of marble above us. Markov's sword balances on the edge of the hole, then falls beside us, sticking point-down in the stone. I touch the cold stone floor, pawing for my spear, but it's missing. It must still be upstairs. Instead I touch a dark shape, a burn scar on the floor, the remains of some mighty spell. It is shaped like wings. Angel's wings. Above us, the fiends are shouting warnings. Their pleading echoes through the halls. To me they sound like unanswered prayers. "You should know this place," Markov says, getting up off me, wiping his fang-filled mouth. "This is the place where you were made." I rise. The wound at my neck bleeds, but I let it bleed. Somehow, in this place, it feels like healing. "Where you made me what I am," I say. "Let me help you, my child," the monster says. "I could...cleanse your mind. Make you a proper instrument of virtue again. I'll make you anew." Never. "If I am not the daughter you want..." I say. "...then we must battle again, and again, forever. For I will never yield. I am no monster's instrument. I will not be altered by the likes of you." I can feel my strength returning already, here in this holy place. I am inexhaustible. In a moment, I will be ready to strike him down again. "No," Markov says. "This ends. Now." "I know what you will do," I say. "So go on. Create another vault of silver. Imprison me. That is the only way you will stop me from doing everything in my power to destroy you." "The prison is gone," he says. "I cannot create another Helvault, just as I cannot create another you." I gather my strength. "You are my creator. You must know the way of this world. What cannot be destroyed must be bound." Markov unsheathes his sword from the stone floor. His words are quiet. "But Avacyn...you can be destroyed." I cannot see his face now, because he turns away from me. I cannot see whether he is monster or man. I can only see the point of that sword. I can only hear ancient words, words of a ritual performed in reverse, words of a gift being revoked. I can only feel my knees dropping onto the unyielding limit of the Cathedral floor. I can only smell the ash of some nearby smoldering. I can only touch the shadow on the floor under me, the shape that marks my first moment. I can only say to you, in this, my final prayer to the world, that I only ever meant to keep the innocent from harm. "What—have you done?" Jace demanded. Fumes rose from the burnt place on the floor, drifting up through shafts of light from one of the cathedral's skylights. Avacyn was no more. The cathedral felt overly large now, somehow. Too much space under the rafters. Too vacant. 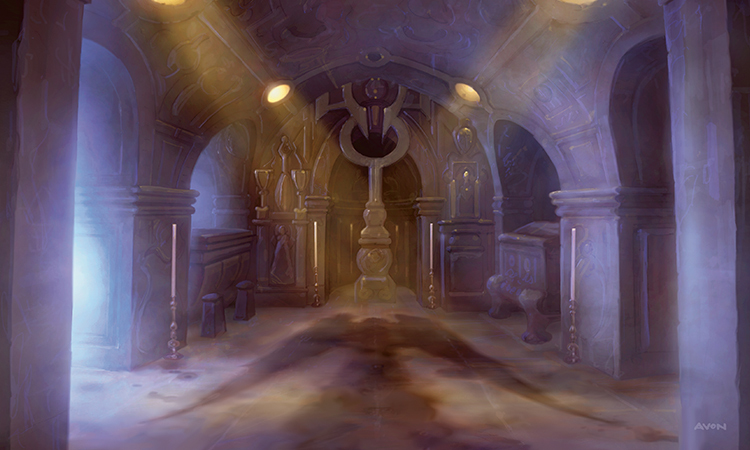 Jace glanced back and forth between the space that had been Avacyn and Sorin's face. The vampire was trembling slightly, fists clenched around his sword, as if trying to hold an earthquake in his chest. "I had to," Sorin whispered. Jace made incredulous gestures with his hands, unable to figure out which of the eleven things wrong with that statement to insist on first. In the end, he turned to Tamiyo. "Did he have to?" Tamiyo only frowned. She hiked her robes and squatted on the floor, reaching out with gloved fingertips to sample the ash remains. She rose, rubbing the ash between her fingers. She rested her hand on a small telescope on her belt, like a warrior touching a reassuring weapon, her eyes fixed on Jace. "This will have...consequences," she said. Jace nodded. "The people of this world have lost a protector." An extended, guttural bass rumble rolled across the sky, profound and booming. The sound thudded in Jace's chest and shook dust from the ceiling. Tamiyo looked grave. "The plane has lost its protector," she said. 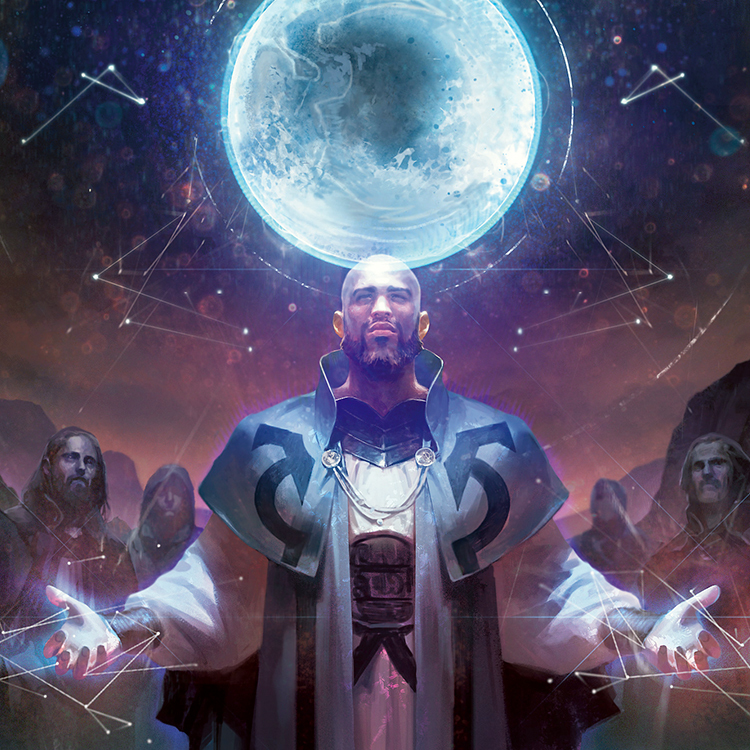 The world rumbled again, this time under Jace's feet. The ground shuddered, the tremor intensifying from moment to moment. Flagstones jittered in their ancient mortar. 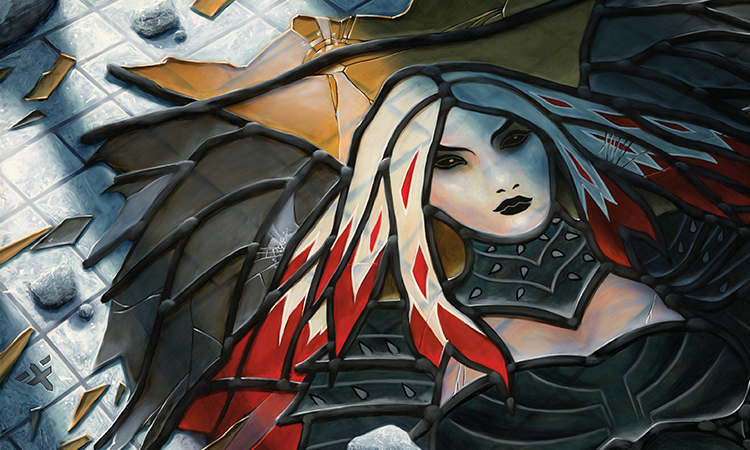 Shards of stained glass shook and fell, tumbling from leaden frames that depicted Avacyn's face, and the shattering sound echoed through the vacant halls. The tremor subsided. The echoes fell silent. Jace watched Sorin shove his sword into his scabbard and turn away, his collar pulled up around his jaw, his shoulders hunched. The vampire glided up a staircase, his fingernails raking pits in the marble bannister. The stairs were sunken and pitted in their centers, Jace noticed. Attrition from centuries of footfalls. Centuries of worshipers. Centuries of seekers of Avacyn. "What have you done?" Jace called after him. 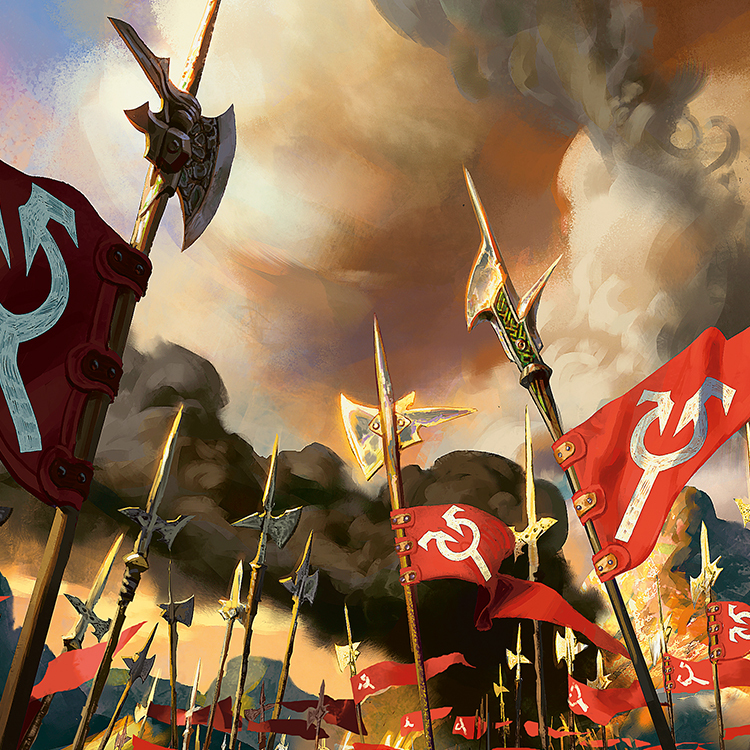 The Shadows over Innistrad storyline will resume on June 8. Until then, check back in the next two weeks for new tales from around the Multiverse.